Did they remove the inappropriate part of tutorial? I have no idea what are you saying. What do you mean? The devs literally said they cancelled NF because 90% of the player base didn't like it. The guy named Naval front line is just a normal player and my fleet mate, his name is imperial geek. He's not a developer. And the video you have uploaded, is of an event conducted by my fleet (SFA) because they're administrators. The uploader is shocked by that CV and has mistaken it for NFL2. And yeah, for the trailer, here. https://www.youtube....?ci=_POjEUKrNi0 The name was changed temporarily because of testing and enabling Inapp purchases. The name will be restored. 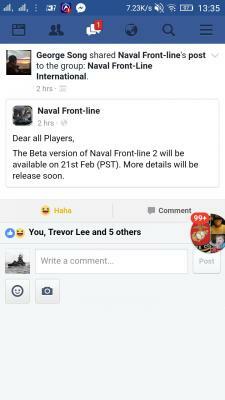 AA guns and Airplanes and carriers will be added in official release. Edited by blackgale, 12 February 2017 - 12:03 AM. Now, the official release will be on 21st February. Edited by CaptainPrice, 16 February 2017 - 09:50 PM. That's incredibly stupid to say. Why would they add that to the game? You and your unrealistic proposals smh. My best is HMS Vanguard. Edited by blackgale, 16 February 2017 - 10:43 PM. And u say all my proposals are "unrealistic" which is started to really annoy me. Edited by CaptainPrice, 16 February 2017 - 10:46 PM. Randy has a point, mate, Tillman class was supposed to have 15x18" guns, which would be very op in game. u think that is OP? The A-450 is an AVBB with 9 main turrets, each holding 3 18.1" guns a piece = 24 guns XD that probably wouldnt fit in the dock (._. ) and who knows how many 2ndary guns ._. Edited by CaptainPrice, 16 February 2017 - 11:18 PM. Edited by CaptainPrice, 17 February 2017 - 05:45 PM. Why would they add a 1861 to a game featuring ships from WW1 and WW2 ships. Edited by m1 tanker, 18 February 2017 - 11:17 PM. Edited by CaptainPrice, 18 February 2017 - 11:51 PM. The Japanese only had destroyers, the US focused on carriers only, Germany only cared about Cruisers, the UK stayed with their fast cruisers and old Battleships, Russia only had destroyers and PT boats. You seriously think anybody would waste a heavy amount of resources just to build that scrap of metal which could be easily be sunk by 2 Essex class aircraft carriers spamming SVDs, Dauntless, and Corsairs slamming rockets at their AA? When they could build something as beneficial as a Aricraft carrier? Edited by randy12345, 20 February 2017 - 02:15 PM. Edited by CaptainPrice, 20 February 2017 - 05:54 PM.